Lab Series Powder Treatment Shampoo is an advanced shampoo for thicker, fuller-looking hair. 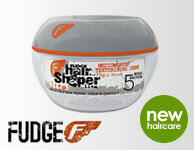 A lightweight, invigorating conditioner that contains American Crew's exclusive Nutra-Rich Copper Complex. Delivers a highly concentrated nutrient-rich formula of copper peptide, saw palmetto and green tea to hair and scalp. This serum offers restorative benefits to optimise scalp health and expand the life cycle of each individual hair.